Rattenkrieg; the word conjures up visions of hell on earth. It speaks to us of enemies fighting and dying for yards or feet. Soldiers of both Germany and Russia collapsing exhausted meters away from each other, trying to get some sleep. Food or water, their thirst and hunger would never be able to be satisfied. 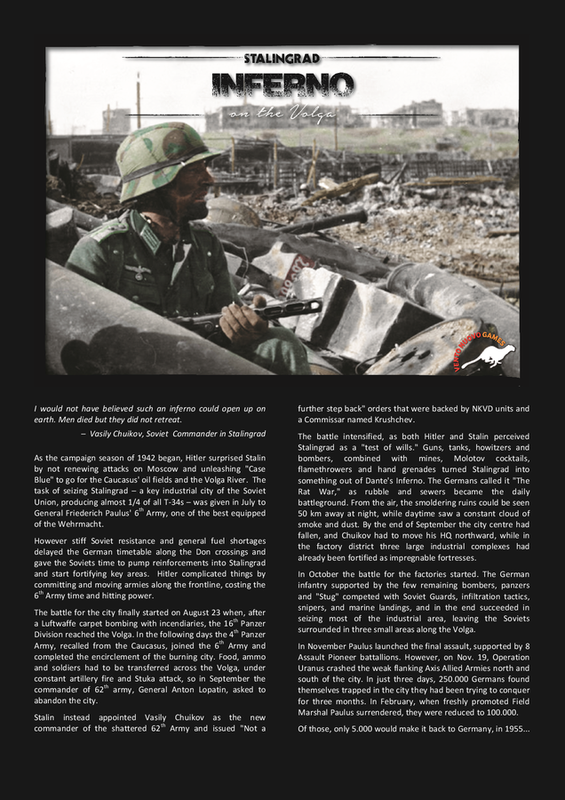 It was death, plain and simple, with just a trickle of soldiers able to carry up supplies to the 'front lines'. Some houses had Russians on one floor and Germans on the next in a weird puzzle like creation. The battle has been called 'Verdun on the Volga'. This was because it was one of the few World War II battles that approached the desperate fighting for little or no gain as in the Western Front in World War I. 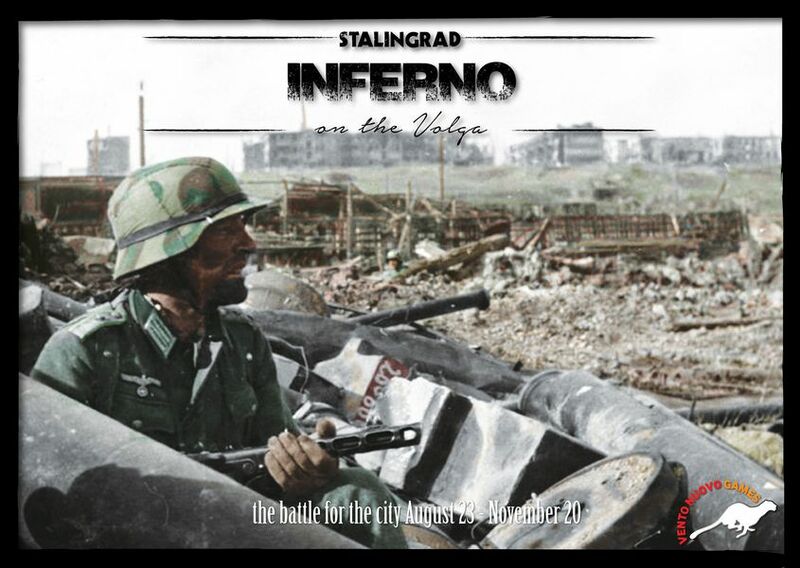 In this review, we take a look at Vento Nuovo Games 'Stalingrad Inferno on the Volga'. Like the two other games I have reviewed of Vento Nuovo's, the components are very well done. The blocks are smaller than their other games at 5/8". The map is the masterpiece of the components. It represents 30 km of the the Volga' with each hex being a huge 1.1km in size. It was made by piecing together different air reconnaissance pictures right before the storm hits the city. The area of play has 109 of these extra large hexes. The Germans control only four hexes in the beginning. The playing cards are also very well done. The are also easy to read with very well done pictures. 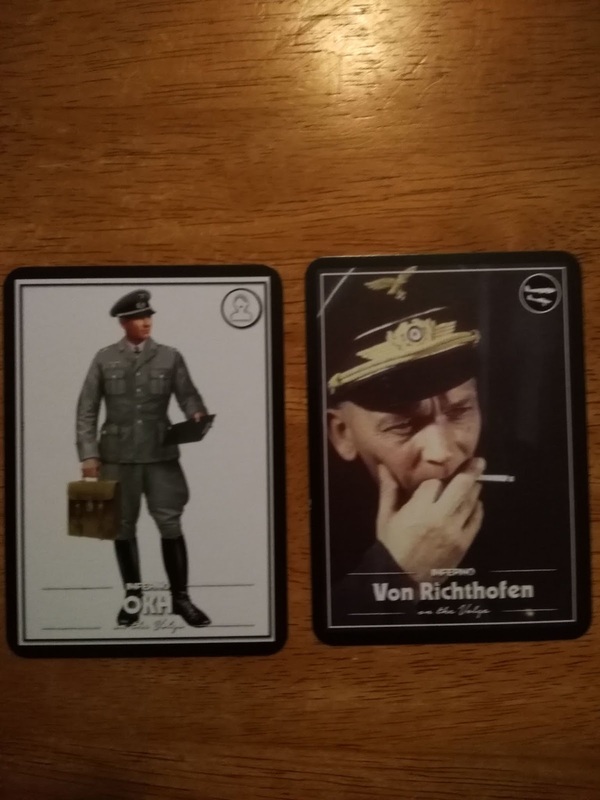 The German Card Deck gives the player four different Leader cards to possibly play: Paulus, Hoth, von Richtofen, and Linden. As an example, the Hoth card gives the player the use of Combined Force Bonus and Blitz movement. 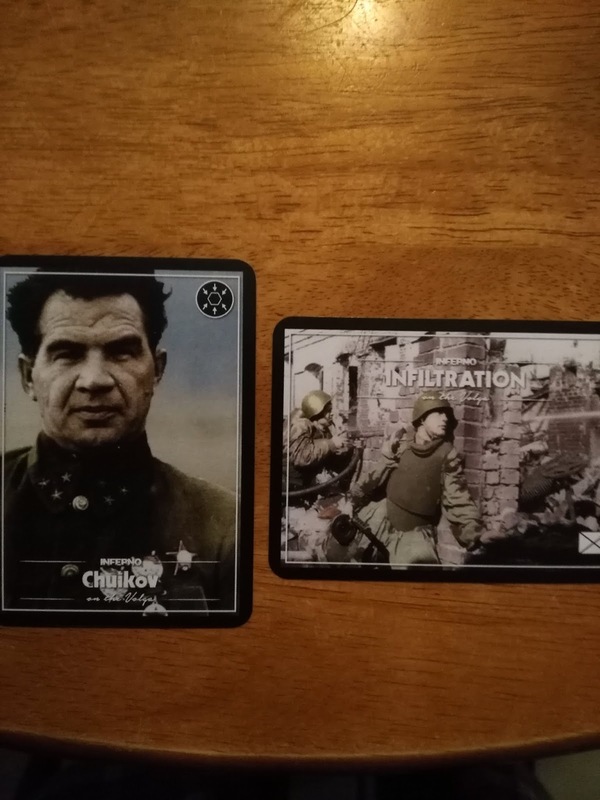 The Soviet Cards have three leaders: Chuikov, Zaytsev, and Khrushchev. 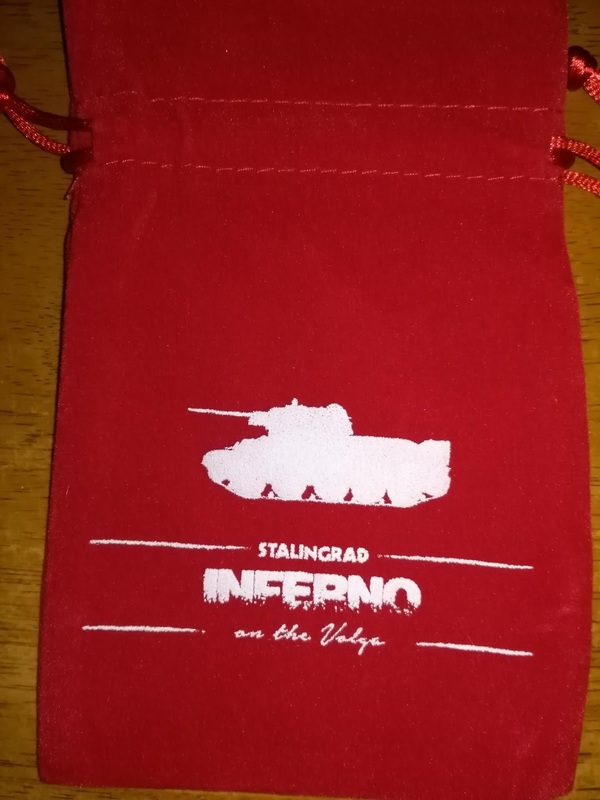 The Chuikov card allows the Soviets to always perform Opportunity fire when defending and Soviet Hasty Attacks are now Deliberate Attacks. The game itself has only one scenario, but it does have some 'what if' changes to troops, etc. This will make it either easier or harder for each player or solitaire play. The game is big and the rules try to add as much history and flavor as they are able to. However, this is not a monster game in length or rules. Game play was designed with a one hour gaming session in mind. So this is a players game, not a stare at the board for an hour before each move. The rule book itself is only twenty pages long. It is in full color and uses large type so it is easy to read. The rules are explained well and are simple, yet let us use a word used to describe other VN games: elegant. The designer describes his long fascination with the battle of Stalingrad. He also goes into detail about the numerous sources he has used to make the game. The Germans have a chance to win the game, just don't dawdle like they did once they first got to the city. L'audace, l'audace, toujours l'audace. Get to the Volga' as quickly as possible. For the Russians, it is the complete opposite. Do not waste your troops. Dig in and let the Germans come to you. Only counterattack when it is absolutely necessary, or you see that your enemy has made a mistake you can take advantage of. The game achieves its design in being a fast paced game that you could probably play though a few times on game night. 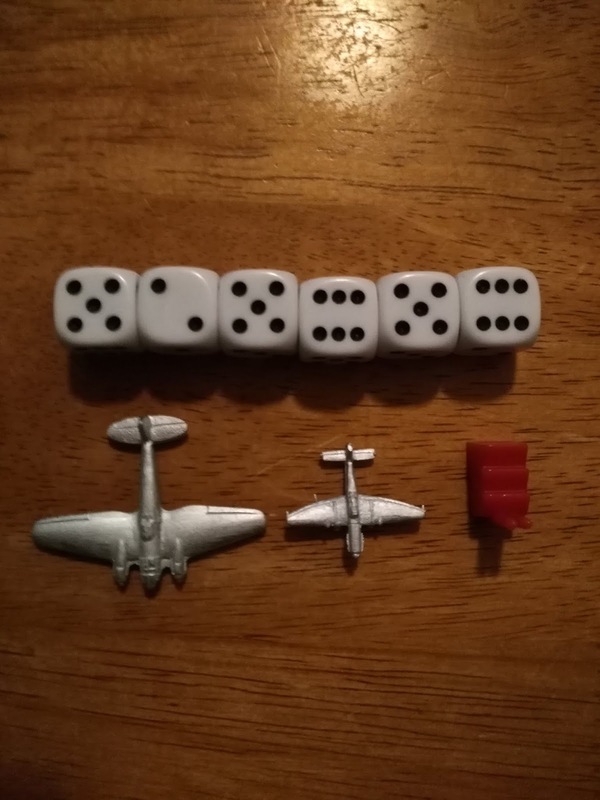 The game has so many different ways to play. 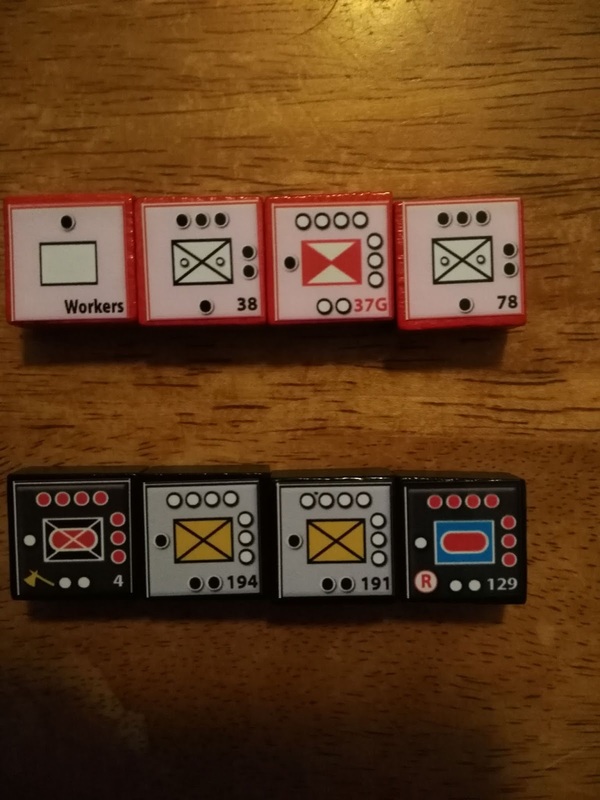 You can play: Easy German Level, Easy Soviet Level, Impossible German Level. There are also additional rules that the designer recommends to play with. The game lists the solo mode as having a 'Soviet AI'. Unlike most games, this one can actually boast of this. Many times, games are built from the ground up as a two-player game, and then have a solo mode tacked on at the end. 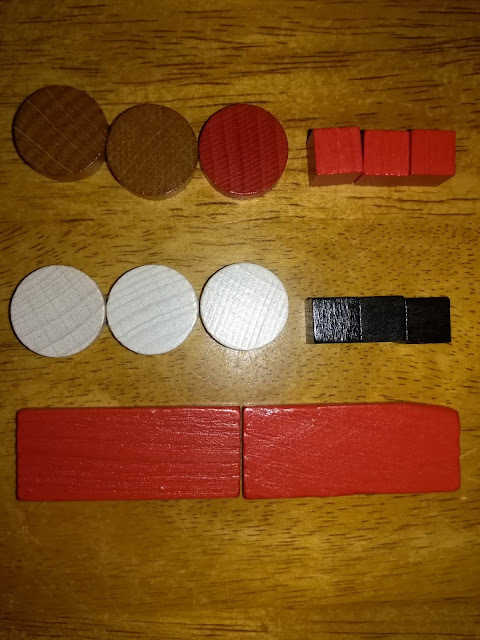 The short easy to understand rules will have you playing in no time. Your first few games will naturally take longer, but the later ones will be just as advertised. 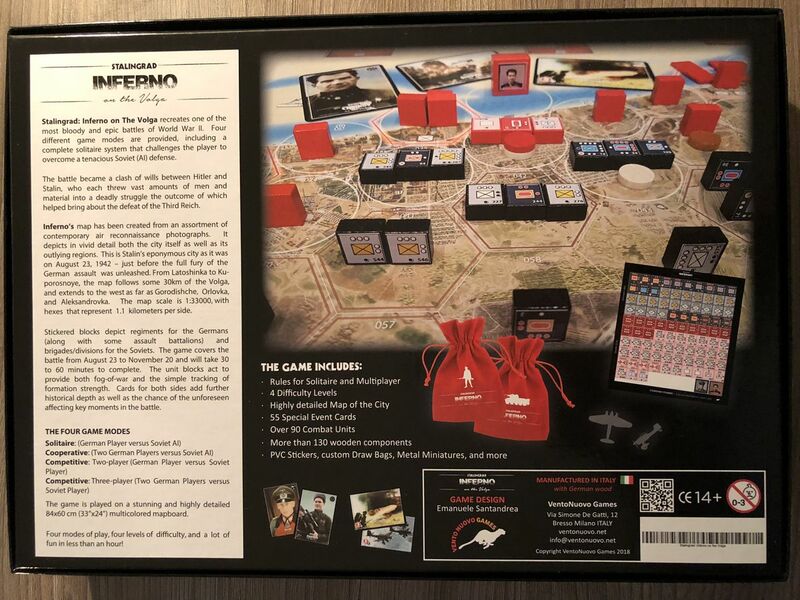 Vento Nuovo Games has been able to take a large complex battle and tame it to simple to follow rules. However, they have not made it a 'beer and pretzels' game. It is deep and full of historical flavor. 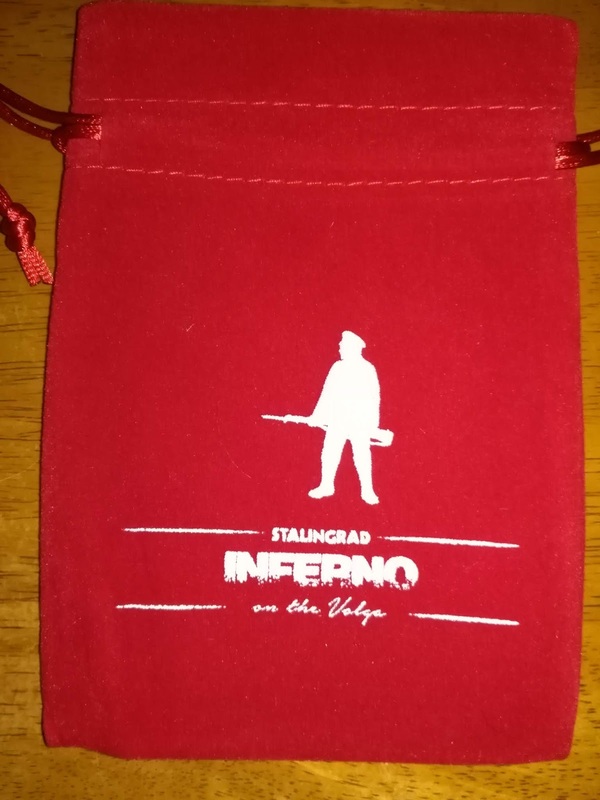 'Un bellissimo e bellisimo gioco'. Google translate gave me two different versions, so I hope it works. Unfortunately, all I know is Italian swear words.